Indian corn patch was harvested today.Twenty pounds were obtained from the patch of 8 by 10 feet. A raiding squirrel has taken around half the crop over the growing season.The husks were removed and the corn placed in the shed to thoroughly dry. The kernels will be removed and the corn processed into tortillas. 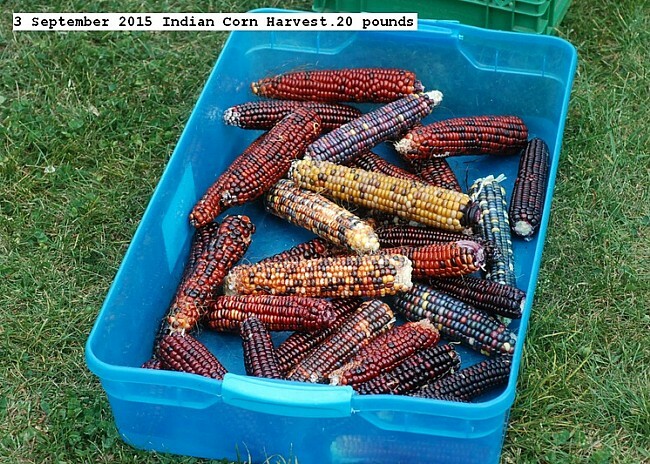 This entry was posted in Uncategorized and tagged 3 September 2015 Indian Corn Harvest, Indian corn. Bookmark the permalink.